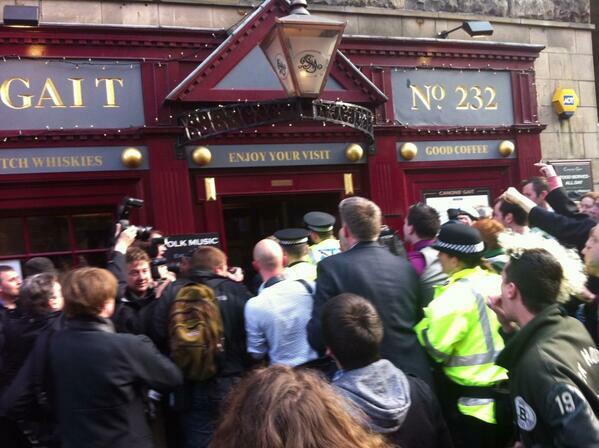 Scottish racists were today responsible for barricading Nigel Farage in an Edinburgh pub. The sweet irony is that the racists shouting "Leave Scotland, go back to England" and "You can stick your Union Jack up your arse" at him claim to be anti-racism protesters and being barricaded inside a pub and the centre of attention is a dream come true for Nigel Farage! When conference delegates in Birmingham voted to send Farage to Scotland on a unionist "tour de force" I warned that it was Scotland's business and we'd be resented for interfering. Let's see how the Scots react to today's events before anyone else's safety is put at risk spreading an unwelcome message to an intolerant audience.